Hello! 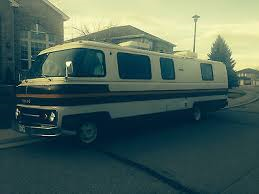 I came across your site this weekend while researching how to polish up a 1976 Travco TravStar 320. It is a fiberglass body so I want to be careful about what products I use, but need to do it myself to save $$. I have decided to go with your product and am just curious how much 1 bottle of the finish restorer will cover. Will 1 bottle do a 32′ motorhome or will I need 2 of them? This is going to be a fun project! Your rig is going to look really cool when you get done with her…. I would suggest our $99. RV Finish Restorer kit. It will include the correct buffer, pad and 1 bottle of RV Finish Rejuvenator with Wax. Yes, for your project I would order a second bottle. I obviously have not seen your rig but I would recommend a good Beast Wash to give your finish a deep cleaning before you start the buffing process. Beast Wash will remove containments that the RV Finish Rejuvenator cannot. I hope this helps, keep me posted on your progress.